Sanibel-Captiva is a long, backwards J-shaped island just off Florida's western coast near Fort Meyers. Our suggestion said we would find cheap beer, cheap grub, beautiful beaches full of seashells, dolphins and manatees and a funky little antique shop. We couldn't pass any of that up, especially in February when we would normally be bundled up, shivering and trudging through the slushy snow in New York. It was 75 degrees and sunny; we were gonna stick it to winter and spend the day at the beach. We got to Sanibel in the late morning. As soon as we drove over the causeway onto the island, we were stopped at an intersection by a jovial traffic cop. I'm not even sure he was a cop, I think he was a traffic-directing volunteer. It was the khaki shorts and flip-flops that gave him away. There's really only one main road on the island with two, maybe three relatively busy intersections so instead of traffic lights, they have a guy stand there happily directing traffic. The old lighthouse at the southern end of the island seemed to be a good place to start our day. We parked the truck and followed a white wooden walkway through a dense tropical forest until we came across a rusty skeletal lighthouse with a small plaque at the base. Uninterested, we continued to the beach and found a spot to set up our chairs and begin basking in the warm February sun. 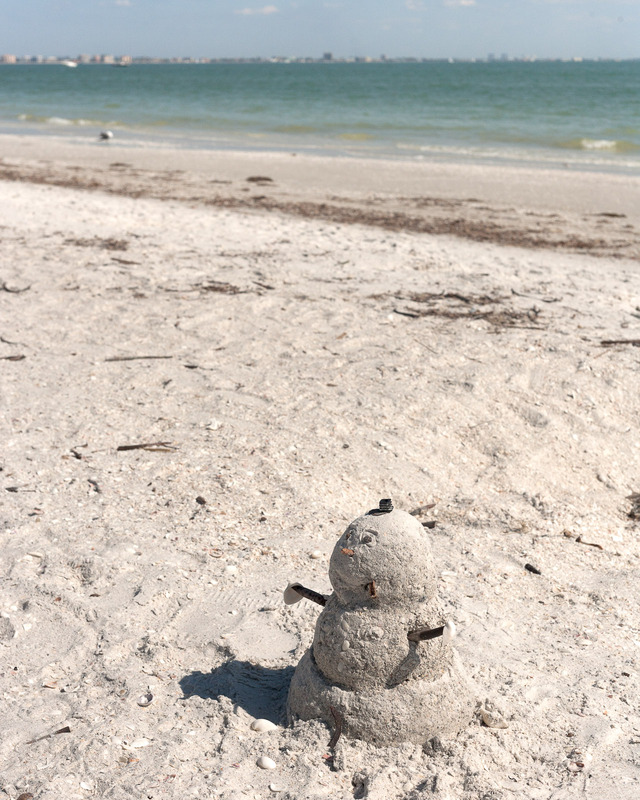 The beach was surprisingly crowded with mostly seniors and snowbirds from the North spending the winter in Florida. Many of them were walking along the shoreline, heads down, scanning the sand beneath them. Sanibel is famous for their shells; people come from all around to go "shelling". Because the island is uniquely situated (the coast is east to west instead of north to south like most islands), millions of shells get washed on the beaches making it one of the best beaches in the world to find large unblemished shells. We did our fair share of shell-searching but weren't that impressed. I was expecting huge conch shells and big beautiful sand dollars, but it was mostly your standard small beach shells. Wrong time of year perhaps? Best to leave it to the professionals. Our tummies began to rumble, so we headed to Doc Ford's Rum Bar after hearing that they have the best grouper sandwich on the island. We drove along the island's sole main road, which aside from a few small shops and restaurants, is lined with thick forests of palm trees and tropical vegetation. It wasn't like the touristy, chain-restaurant-filled Key West, it felt like our own undiscovered island. We found Doc Ford's, an oversized island-y hut of a restaurant that was filled with locals and tourists alike. 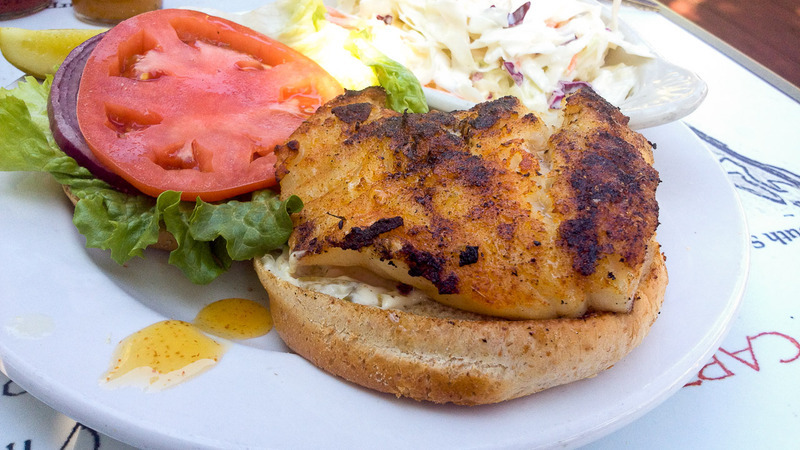 We opted for the patio and barely had to look over the menu of mostly Caribbean and Floridian seafood dishes to go for the grouper sandwich; one blackened, one fried. Our sandwiches arrived; they were HUGE. So much grouper. Like two New York City restaurant portions of fish. Maybe three. The bread couldn't even contain all the super moist, fresh, meaty grouper; half of it fell out onto my plate. We left full, satisfied and ready for a nice long nap on the beach. On our way up to Captiva, at the narrow north tip of the island, we passed by quaint beach houses nestled into the jungle as well as giant gaudy ocean-front mansions with sprawling front lawns. We made it to the North End Beach, a long and narrow strip of sand with calm waves, flanked by tall pine trees and beach houses. We spend the rest of the afternoon laying on the beach, watching the sun go down and jumping up with our cameras every time someone spotted a dolphin near the shore. As we were getting ready to head back to the campground, we got a last minute suggestion from our friend Karen. She said we absolutely had to go to Islander Trading Post, an antique shop on the main road. 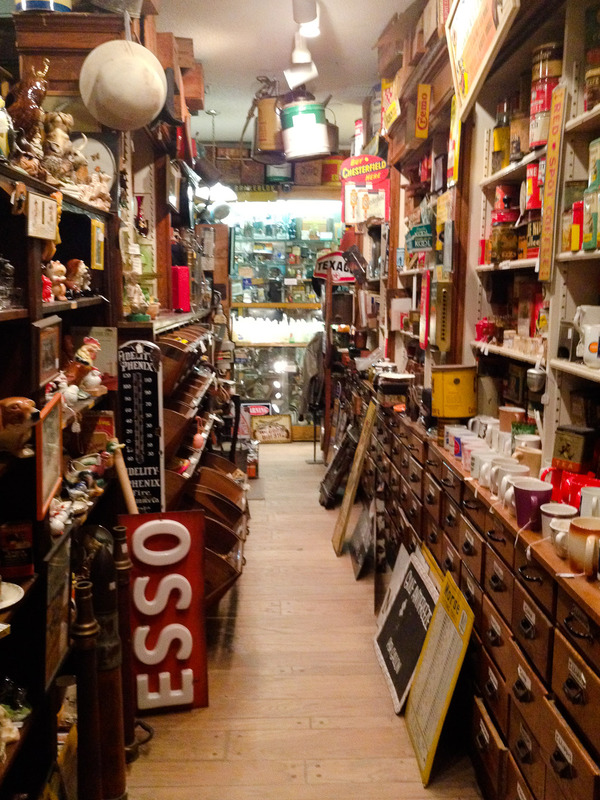 We walked in and were amazed; the shop was floor-to-ceiling full of neatly organized knick-knacks. Tin milk jugs, glass buoys, and art deco posters were hanging from the ceiling. Aluminum signs advertising everything from gasoline to whiskey were stacked against drawers full of souvenirs organized by the state in which they came from. There were four shelves dedicated to Christmas. Two to cat statues. Drawers filled with bottle caps. An entire side of the shop devoted to kitchen wares with everything organized into appropriate categories . It was like a really crowded, really well-organized museum where everything was for sale. After wandering around in awe for an hour, we wanted everything, but settled on a metal ice cube tray (which we later discovered is THE BEST ICE CUBE MAKER THAT EVER EXISTED) and a funky orange ash tray. 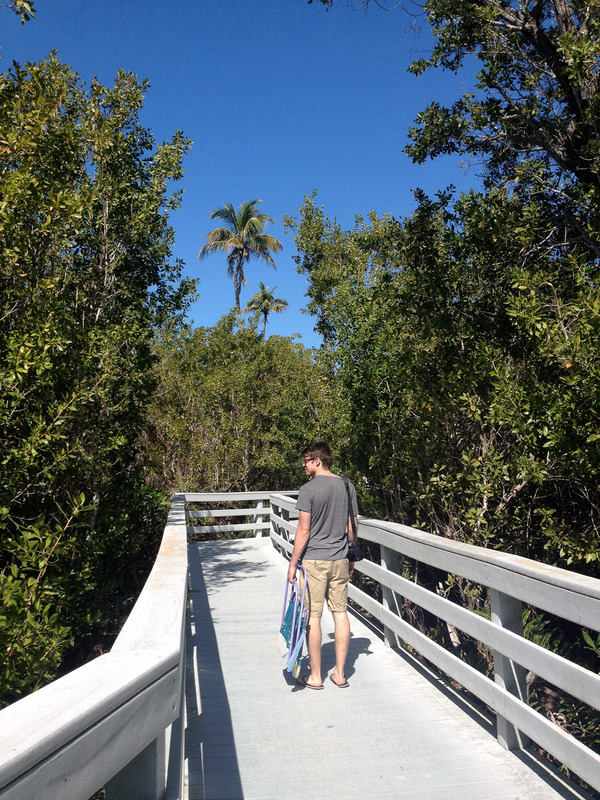 Our day on Sanibel and Captiva Islands was relaxing and laid-back; exactly the way a tropical island should be. The warm sand, fresh fish and beautiful beaches made it all too easy to forget that it was February. Special thanks to karenarms (who suggested Kayaking with Dolphins and Manatees and Be Amazed with all the old trash from decades past (Antique Shop)) for making this blog post possible!